For particularly demanding pressure sensing applications, e.g. in medical and instrumentation devices, Sensortechnics now offers custom piezoresistive pressure sensors with very high resolution and accuracy from 2.5 mbar full scale. A high-quality, low noise amplifier and subsequent 24 bit A/D converter provide for high resolution digital signals comparable to analog signals and high signal-to-noise-ratios. The sensors utilise a microcontroller which allows correction algorithms for temperature compensation and linearisation to be programmed flexibly. 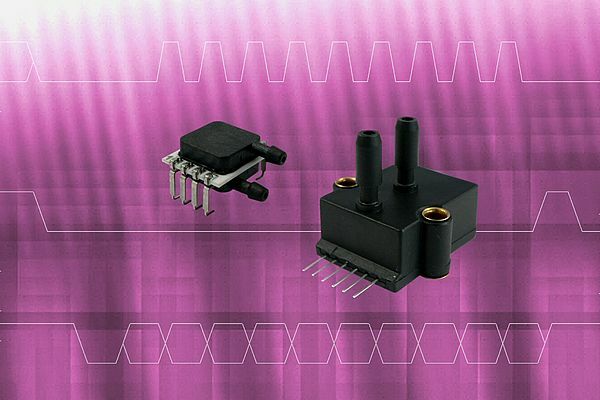 The microcontroller-based pressure sensors achieve high accuracies with a typical total error band of 0.1 % and fast response times of up to 250 µs. Sensortechnics' pressure sensors with integrated microcontrollers offer various possibilities for custom specific adaptions. These can include the calibration, signal conditioning and signal transmission of the sensor. Within the overall pressure range certain subranges with different resolution and accuracy can be calibrated. This functionality is especially valuable for medical ventilators or patient monitors which determine respiratory flow by means of differential pressure measurement. For these devices, an increased sensitivity at very low pressure is essential for the early and precise detection of the patient's inhaling phase. Furthermore, Sensortechnics offers modifications of the digital sensor interface (I²C, SPI) according to customers' requirements and programs custom communication protocols as well as additional functionality such as status requests, diagnostic messages or an auto-zero function.